We've been clearing out our stock of photo samples, discontinued fabrics and new in-box dining chairs, parsons chairs and benches. There are some really great deals to be had. With a large variety of styles and colors, you should be able to find something that matches your decor and tastes. Outlet items are limited in quantity, but they are perfect for accent pieces. Several chair styles have 6 or more available, so in many instances an entire dining room could be be outfitted at a bargain price. Best of all--furniture in the outlet is new and unused. It may have ended up there because it was used as a photo sample or because an order was canceled before it shipped. In any case it is a win-win for you. 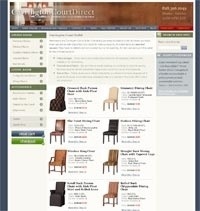 You'll get quality furniture and save even more. Visit the Carrington Court Direct Outlet today!